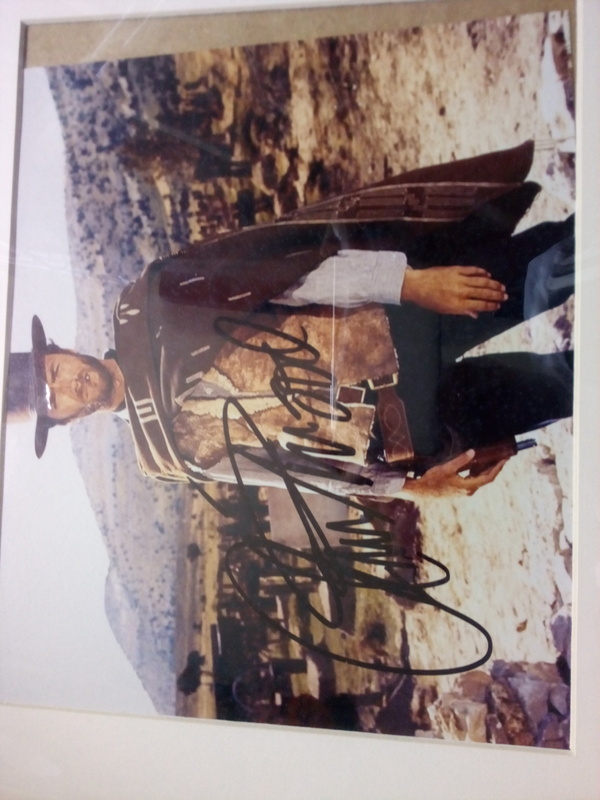 Re: Clint Eastwood autographs: authentic? Nice examples! Did you get them in person? Thank you-I wish I got them in person! Unfortunately, we all can't get autographs in person. I've been looking at authentication services and if one can get a PSA/DNA or JSA authentication, not at sport/celebrity shows or events, and if the seller's lifetime coa includes a willingness of the seller to refund your money if it does not pass PSA/DNA or JSA authentication. (The reason I say not at sport/celebrity shows or events is because PSA/DNA or JSA sets up booths to authenticate autographs right there, but the person may not be an expert in that field. For example, a Clint Eastwood signature expert may not be there and is more familiar with sports signings. If he fails to recognize a version of Clint's signature, then he will fail it.) Now, does that mean that if you have a PSA/DNA or JSA authentication it means you have the real McCoy? NO! However, if you have done your homework and are familiar with Clint's autographs, secretarials, autopen, fake signatures, then there is a high percentage you've got the real McCoy. Some other things to consider. Can you get Clint's signature from a canceled check, contract, letter using his stationary and heading (note: the stationary can be authentic, but the signature could be secretarial) or other document, then it makes a stronger case for it being authentic. If a celebrity is a difficult signature to get, and is deceased (making it even more difficult), then probably this is a good way to go. For example, Leonard Nimoy did not sign a lot of autographs and there is great demand. Thus, there are many, many fakes out there. It does not cost much to forge a signature on a photo or blank card. If it's on an item of value such as a Star Trek contract, then most likely it is real. Forgers will not put out a lot of money to fake it (although an item that could go for hundreds of thousands or more could be by a skilled criminal). Hoping for some help with an autograph, but don't seem to be able to attach a photo? I have bought Clint's photo on Ebay from 100% seller very long list of sales in this genre, paid about $100 on auction and I did feel lucky! But then read this thread, and now I am not sure... hope you can help with some thoughts. Love the photo, which by amazing coincidence is this sites banner choice, which I found later. Not 100% sure which movie it matches closest ... Pale Rider looking brim, and Clints approx age. What do you think? Do I really want to know? The start of the C bothers me, checked secreterials and luckily didnt find any that matched. The picture is from Unforgiven, which I recommend highly, if you've never seen it. As to the autograph, I have no expertise, but our resident expert, palooka, will usually stop by to answer questions like these. I'd certainly never describe myself as an "expert". I've just been looking at his signature for many years. What I can say is the above image is not an autograph I would have bought. Maybe the supplier has an image of it being signed? Which is becoming ever more standard practice these days. Appreciate the thought (ya big palooka), I am happy with idea of people with long experience having a gander. Unforgiven... doesnt get much better:-), so many great movies for this Oz fan. Is it the smudginess that makes you pass or not close to any Clint signing you have ever seen? I thought when I bought very free flowing and fast given the crossovers, and it would have been hard for a forger to shape to the curve of the brim that freely. It is the 'C' that I have picked on starting on the wrong spot. The large lassoo E going through the T looks so smooth confident and at the right angle for late "Eastwoodie." Love the photo, and the signature even 60% likely to be Clint is fine for me, looks better in real life than scan. I will check back with the seller about a signing photo, none offered with sale. Oh, another Aussie Clint fan. There have been a lot of them on this board, and one of our Mods is from Oz. You'll find one of our longest threads is in the Off Topic forum for Aussies. Stick around, Palest. We can use more true fans on this board, and sometimes just one person's enthusiasm can reignite the whole board. It gets quiet around here sometimes, but it's a good community. As for the signature, sometimes it's better not to even know. I have a signature that someone told me was probably authentic. I framed it with my favorite Josey Wales photo, and it's one of my favorite things. But, I'm afraid to find out it's not real, so I won't post it here. I just like to think it is. I have been collecting signed DVD/LD/VHS covers for a while. 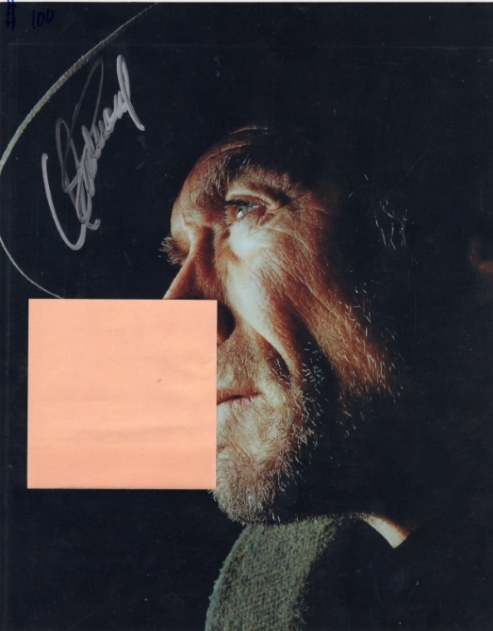 Clint Eastwood is one of my favorite actors and directors so I would like to have at least one signed by him. I stumbled upon this LD version of "The Good, the Bad and the Ugly", which according to the seller has been signed by Mr. Eastwood himself. 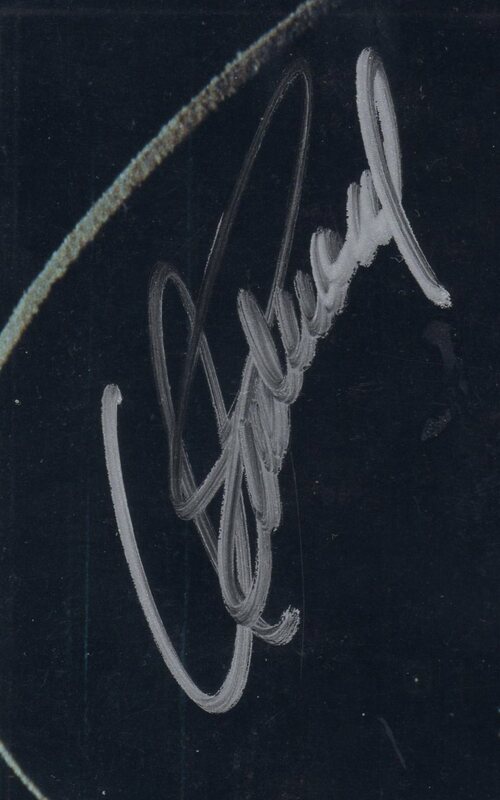 However, the signature doesn't look anything like the other signatures I have seen by him. Which makes me question it's authenticity. But maybe his signature has changed through the years, he was in a hurry or something. What do I know. It has been authenticated by Global authentics but they could be wrong, which I have found out isn't uncommon at all when it comes to this kind of stuff. Anyway, what's the expertise's opinion? That one looks like it might be OK. Global Authentics are generally pretty good and it does give you the reassurance of being able to re sell it on afterwards with their COA. HI All, I'm looking for some help to confirm the signature in the link below. I'm afraid that is not Clint's autograph.